It takes a very special kind of feel-bad film to make you feel good, but You Were Never Really Here is a towering piece of filmmaking that ought to be celebrated, despite its tar-dark subject matter, viscerally assaultive style, and devastating violence. In just under 90 minutes, viewers are taken on this simple journey of vigilantism that will overwhelm the senses with such a palpable sense of dread, brutality, torment, and a smidgeon of much-needed hope. The film begins with a barrage of disconcertingly abstract shots, which reoccur at times throughout the film to continuously instill a vicious and ferocious mood, which perfectly accentuate the disturbing story. This story of which begins simply enough, with assassin-for-hire Joe (Joaquin Phoenix) finishing one job and bringing himself back to regular life, caring for his elderly mum (Judith Roberts). Joe is then hired for another job, to rescue the kidnapped Nina (Ekaterina Samsonov), the young daughter of a State Senator, who has received an anonymous text sharing the address of her whereabouts. It may sound like an easy job for Joe, but the film’s storyline continues with increasing unpredictability that ratchets up the sense of dread to a high degree. All of writer-director Lynn Ramsay’s films have focused on characters, using intense imagery and sound to convey their inner angst, and You Were Never Really Here feels like her angriest film yet. Joe is only graced with a few brief, efficient lines, but we get an vast sense of his mindset through not only his disgruntled look and quietly tormented vocal delivery, but the sudden brief flashbacks to his troubled past, the harsh and often jarring sound design, and the monstrous music score which switches between storming electro, off-putting avant-garde, and mournful ambient. It’s hard to say who ultimately leads the film, whether it’s Phoenix’s emotionally wrecked performance, Ramsay’s superb directing that makes everything on screen feel larger than life, Jonny Greenwood’s mood-elevating score, or Joe Bini’s sharp and impactful editing that keeps the story moving forward while fleshing out this disturbed character – they all work together to craft this on-screen tale that efficiently establishes its simply story and overwhelmingly conveys the complex moods that unravel from it. 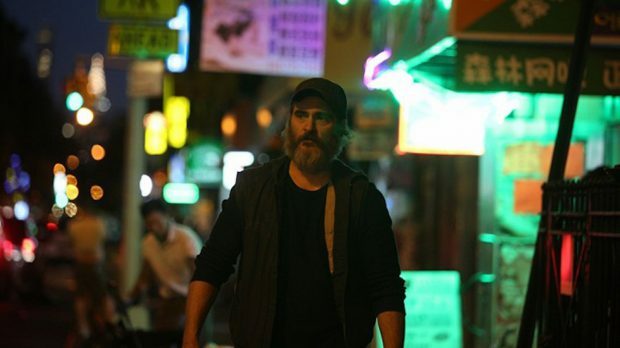 You Were Never Really Here is the sort of tremendous group effort that uses a large array of cinema’s possibilities to take this hellish story and elevate it to heavenly highs.